There’s something great about coming into a new, unexplored city, a sense of adventure and possibility. Though I’m not well-traveled by any means, I have been privileged to see a lot of the ole’ U S of A. Most places–even Wilmington, DE!–have their own set of charms and attractions. Lexington, NC was full of pork barbecue and sweet tea, and Hamden, CT is home to the illustrious Three Brothers Diner. Last week I added yet another city to my list, and Boston for me will be forever linked with wine. While the centerpiece of my trip to Boston was taking the Court of Master Sommeliers’ introductory course, I did also have a little bit of time to explore the neighborhood in which I was staying. South End is a very nice, very settled area with stately townhouses, ample greenery, and hip little cafes and restaurants. I really enjoyed Render Coffee’s dyslexic but delicious BTL and cold-brewed coffee, and had way too much grease from Laz Cafe, and sipped some delightful fino and amontillado Sherry at Toro. I also had some good kidneys and a pint of dark wheat Pretty Things Brewery beer at the South End location of Le Petit Robert, a local Boston chain of French bistros. I tend to go crazy for older wines because, hell, how often does one get to have an older wine? This 2002 was the last of its kind on the shelves, and at around $28 I couldn’t refuse. This wine is from the Mosel region of Germany, which is renowned for its Riesling. I lucked out because it turns out that “Piesporter Goldtröpfchen” is, according to Hugh Johnson and Jancis Robinson, an exceptional vineyard (basically grand cru status). Goldtröpfchen is the specific vineyard in the Piesport region. It is an extremely hilly, south-facing vineyard, with 80-year-old vines that produce, at least according to the name, “little golden drops” of wine. This was a lovely wine. At ten years of age it was a rich golden color and was beginning to have that old white wine smell of petrol and hazelnut. Lemon curd, bouquets of white flowers, honey. Given its Spätlese QbA designation, it had light, honeyed sweetness, and given its Mosel pedigree, it had a fine backbone of slate and high acid to keep the wine in balance. Though not the most profound or complex Riesling I’ve ever had, it would have been worth twice its retail price. I had to think of this wine’s journey, from grapes grown on steep slate hillsides in Germany, to a bottle transported to the US, and then half-forgotten on some store’s shelf in Boston until, after a decade, it finally got its moment in the sun. I’d like to think that there is a fable here somewhere, some way to link this wine to my own journey, but even if not: what a great wine! Thank you! 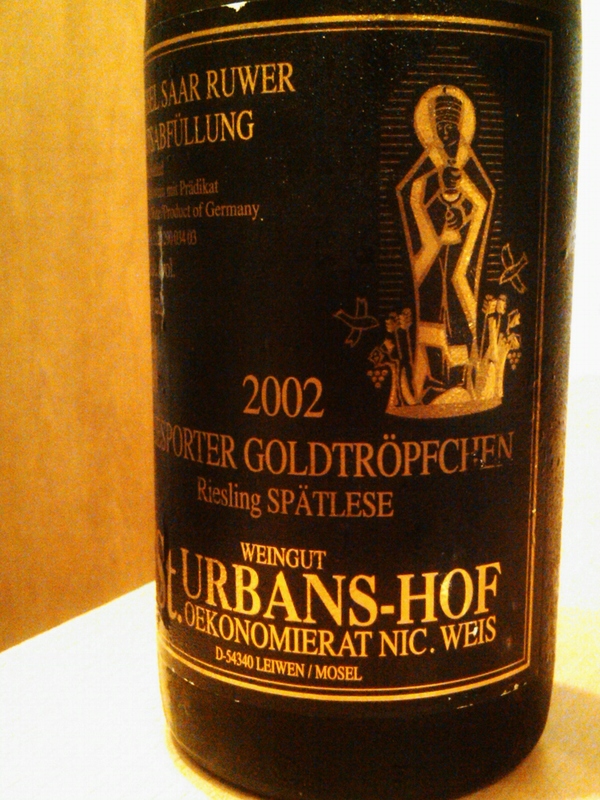 It was a very nice wine and just a good reminder of how delicious German Riesling can be. I look forward to your write-up on Piesport! Ha! Yeah, it was a pretty great wine. I suspect I might have purchased the last bottle, but it bears following up with both locations of the Wine Emporium!